Lauri Shivo was born at Metsäpirtti on 21 February 1909. He received flying training at IRUK 8 in 1938-39. On 8 February 1940, he was assigned to LLv 26 as a vänrikki. This unit was at this time equipped with Gloster Gladiators. On 15 February, his detachment of LLv 26 was subordinated to detachment Luukkanen of LLv 24. On 19 February, luutnantti Paavo Berg’s three-strong patrol of LLv 26 was chasing a formation of 32 SB bombers when it was engaged in combat with various I-153 fighters above Sippola at 15:25. 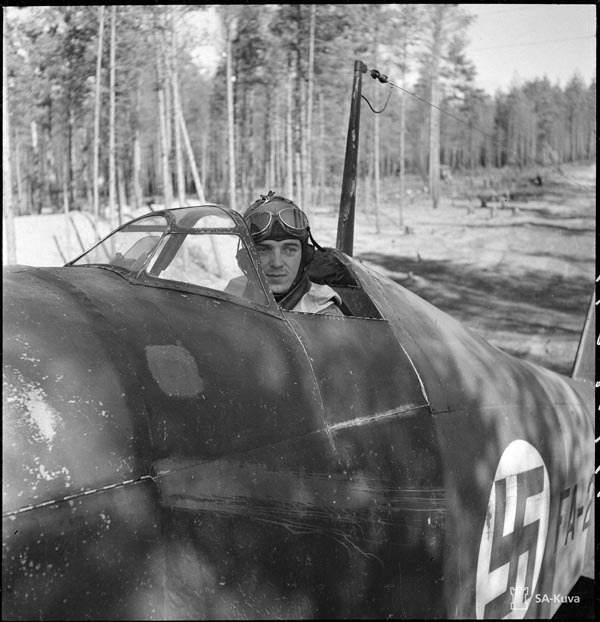 One of the enemy fighters was shot down by Berg and another was shared between luutnantti Poul Christensen and vänrikki Sihvo. The rest of the enemy fighters broke off and headed towards Suomenlahti. They had been in combat with I-153s from 149 IAP, 7 VA, which reported that at 15:40, seven I-153s and four I-16s were escorting 35 SB-bombers. After bombs were dropped, five “Bulldogs” attacked, with four I-153s responding. I-153 c/n 7142 and 7158 did not return from Sippola. Starshiy Leytenant N. Yu. Iyentish and Starshiy Leytenant V. S. Osipov (CO of the 2nd eskadrilya) became POWs. Leytenant Makarov fore-landed at Kotly after lack of fuel while Leytenant Semenov returned with 47 bullet holes in his aircraft. Berg himself had flown the Bulldog for nearly 5 years before the war and thus he had become a skilful pilot and a marvellous deflection shooter. At 16:10 on the same day, vänrikki Sihvo (GL-279) claimed a damaged R-5 over Sippola. Shivo continued to serve with LLv 26 during the Continuation War. Sihvo and Tuominen were each credited with one shot down and a third as a shared. The MBR-2s came from Group Hrolenko. They each claimed one enemy aircraft and claimed a third as a shared. On 3 September 1941, the Karelian Army started the advance to River Svir making it in four days. Thereon the attack continued eastwards and northwards to Petrozavodsk. On the first day, a LLv 26 Fiat swarm was on air combat patrol over the spearhead in the Säntämä-Aunus area between 11:45 - 12:40. The swarm consisted of lentomestari Oiva Tuominen (FA-26), kersantti Onni Paronen (FA-6) and vänrikki Sihvo (FA-3) and vänrikki Carl-Erik Bruun (FA-1) (on his 44th mission). Three Chaikas of 65 ShAP and two Ratas of 155 IAP were engaged and all were claimed shot down. Tuominen shot down one of the I-16s, Paronen claimed an I-153 and Sihvo claimed a second I-153 (from 65 ShAP). 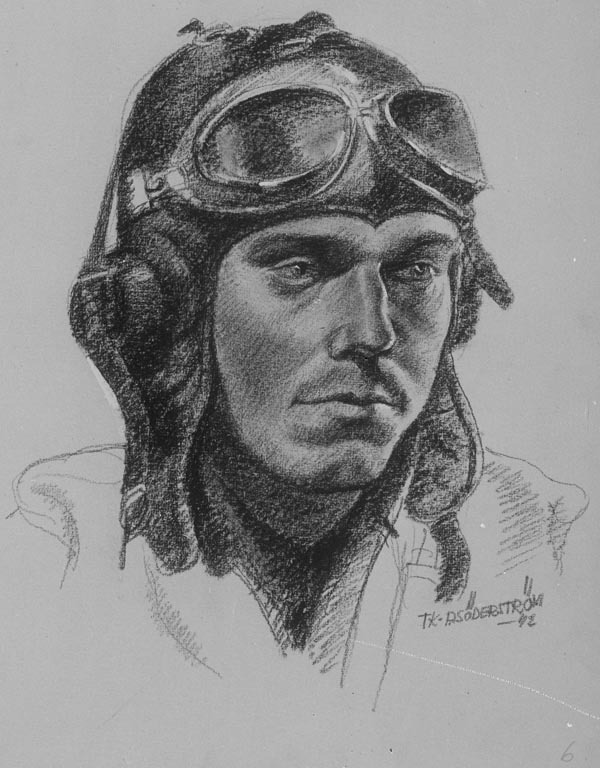 Bruun shot down one monoplane but he believed that he had shot down an own Curtiss and did not at that time admit the victory. The victory was shared at that time between Tuominen and Paronen. The last I-153 was seen leaving for Soviet territory by Bruun, Tuominen and Paronen. 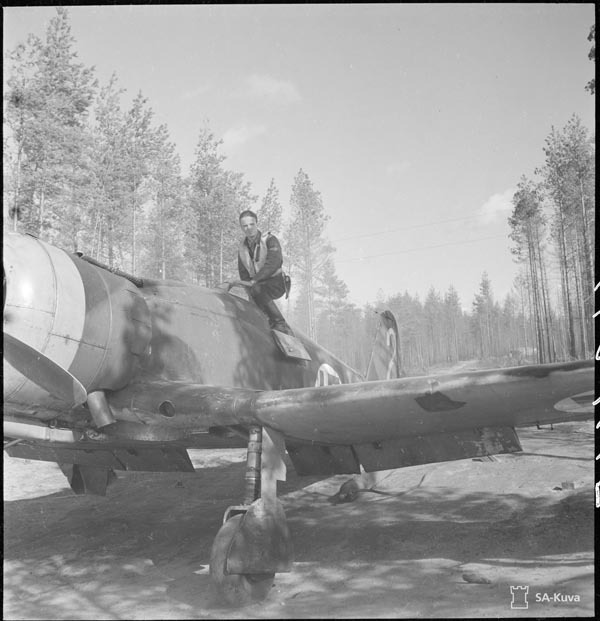 Tuominen flew slightly to the side and behind of the enemy fighter. When he fired the shots went to the right of the I-153 and he had to turn away. Paronen was next and his fire hit the armoured seat and sparkles was seen to fly around but the fire couldn’t penetrated the seat since the Finnish fighters wasn’t yet equipped with armour-piercing ammunition. Bruun was next and he followed the I-153 at low altitude over the fields at a speed of 360 km/h. He opened fire but to no effect. At this time, Tuominen was flying to the right of the enemy fighter and Paronen to the right. Bruun saw the enemy pilot looking at the other Finnish pilots but he probably couldn’t spot him since he was less than ten meters behind him. At the edge of a wood, the Soviet fighter was forced to climb a little and at this time, Bruun opened fire and probably hit the pilot. The I-153 turned over the right wing and crashed into the woods. A new pair of Soviet I-153s was spotted to the left but these chose not to engage and they turned south. The Finnish pilots also turned towards home since they began to be low on fuel. 65 ShAP lost one I-153 and the pilot Leytenant S. P. Korolev was killed while 155 IAP lost one I-16. When they returned to base Bruun asked Tuominen why he didn’t shot down the I-153 and he answered that he had been trying to hit the wing-support since he wanted to see the wings folding on the enemy fighter! Carl-Erik Bruun was the only piloting officer that served all the war 1941-1944 in LeLv 26. He as born on 6 January 1920 in Turku and passed away on 9 October 2001 in the same town. Luutnantti Sihvo at Rautu on 15 August 1942. On 16 September, LLv 26 was transferred to LeR 3 and transferred to Immola. Sihvo was promoted to luutnantti on 30 March 1942. On 3 May 1942, there was a reorganisation of the Finnish Air Force and at the same time there was a redesign of the names of the units and thus LLv 26 became LeLv 26. LeLv 26 clashed with I-152 between 08:25-09:10 on 9 July 1942 over Tappari – Miikkulainen. One of them were claimed by luutnantti Shivo (FA-29) and a second was claimed by luutnantti Olli Puhakka (FA-25). He was transferred to LeSK on 14 April 1944 as instructor. On 2 December 1944, he was demobilized. Sihvo ended the war with one shared biplane victory and a total of 3 victories. During the war he was awarded with two Vapauden Risti 4th Class and the German Eisernes Kreutz 2nd Class. After the war he worked as a pr-manger. Biplane victories: 1 shared destroyed, 1 damaged. TOTAL: 3 and 2 shared destroyed, 1 damaged. (a) Claimed in combat with I-153s from 149 IAP, 7 VA. The Finnish Gladiators claimed two aircraft and Leytenant Iyentish and Leytenant Osipov were shot down and taken POWs while a third I-153 was damaged. (b) Claimed in combat with MBRs from Group Hrolenko. (c) Claimed in combat with I-153s from 65 ShAP and I-16s from 155 IAP. LLv 26 claimed three I-153s and two I-16s. At least one I-153 from 65 ShAP was lost. Information kindly provided by Alexey Andreev, Göran Bruun, Tuomo Lukkari, Lars Larsson and Pentti Perttula.